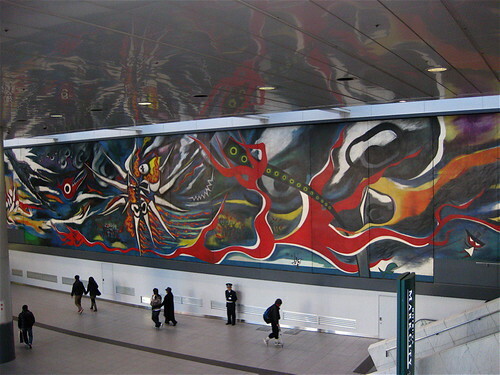 “Art is explosion” is how Taro Okamoto described the act of creation. 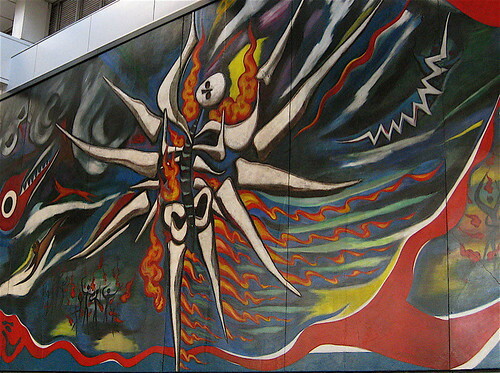 The best example of this is his Myth of Tomorrow, a massive mural that represents the atomic bombing of Hiroshima. It’s hanging now in bustling Shibuya Station, where millions of commuters can glimpse it on their way to work. The central image is a figure exploded by a nuclear bomb. The face of the figure is a continuation of his familiar theme of a sun-like visage. This chilling piece is a marked departure from his usual imagery. Usually, Okamoto’s art has a child-like ebullience. But even these other prepubescent sculptural works that I’ve seen around Tokyo have a certain creepy vibe about them. Though the figure is violently exploding, it is also flowering out. The shadow of hope simultaneously accompanies the horror. Painted in the 1960’s for a Mexican luxury hotel, it mysteriously disappeared for 40 years once the building construction was halted. It was finally found by Okamoto’s assistant, in a warehouse outside Mexico City. It has since been meticulously restored. The 7 original panels were reluctantly halved so that it could be shipped to Japan, and finally hung last November. And now, it’s probably the most viewed work of art in Japan. In 1942, all of his works were destroyed in a Tokyo air raid. This event and his experiences as a soldier during WWII seem to have shifted his art to darker themes. You can see Polynesian influences, as well as elements of what he perceived as the mysticism of Jomon, very early Japanese, pottery. There’s also a museum where more of Okamoto’s art can be viewed. I haven’t been there, but I’ll be sure to make a trek out there soon. Here’s the English link. As an artist I have to agree that art is definitely an ‘explosion,’ something that can’t be contained. The more the individual ‘bottles up’ what needs to be expressed, the more explosive the act of expression will likely be. Thank you for sharing your insights and the background of this piece of work.